In the extensive debate that has followed RCUK and Hefce announcements that ‘Gold’ open access under an ‘author pays’ system is to be mandated (with a short transition period) for the publication of all publicly-funded research, there has been general agreement that open access is good in principle. All criticisms of the disruptive effects of its hasty and early adoption within the UK are prefaced with a statement that research and scholarship should be readily accessible. The context in which open access is being introduced, however, belies the optimistic view that what is intended is wide public access. After all, the government under whose auspices it is being rushed through is one that is ‘privatising’ university education by removing direct public funding and allowing the raising of fees (which will, on average, be the highest in any OECD country), with the disincentive effects already being perceived in terms of subject choice and decline in applications from mature students. Ultimately, the intention is to raise the upper fee cap (strongly lobbied for by vice-chancellors at ‘elite’ universities and pro-market think tanks), while allowing the entry of for-profit providers to keep fees otherwise pegged close to £6000. How is raising the paywall for undergraduate degrees related to removing the paywall elsewhere? Both are integral to a neo-liberal knowledge regime, designed to enhance competitiveness within the global economy while remaining indifferent to widening social inequalities. The secret to ‘open access’ and its role in the privatisation of the commons is found by following the money. The Finch Report, from which the open access publication policies of RCUK and Hefce are derived, perceives the subscription paywall of journals as an obstacle to access to research. By making research free to read it is anticipated that it will be accessible to small and medium enterprises (SMEs) and, thus, facilitate start-up companies and shorten the time from ‘idea’ to ‘income’ (itself, an aim of the wider impact agenda). This, in turn, will encourage researchers to protect their interests through patents and other intellectual property (IP) protections. According to Philip Mirowski (Science Mart: Privatizing American Science, 2011), this has been a longstanding objective of neo-liberal policies, following the Bayh-Dole Act in the USA. However, the proliferation of patents is not the same as a proliferation of useful innovations, merely of licences and of fees and royalties for use. Moreover, as Mirowski shows, it is the same neo-liberal emphasis on commercialisation of IP that is associated with the proliferation of publications and subscription costs. If open access in the sciences is about commercialisation, what explains its extension to the humanities and social sciences? Is it more than simply the adoption of a one-size fits all policy and the coat pinches most outside the sciences? Open access is promoted under a Creative Commons ‘attribution (CC-BY)’ licence that allows commercial and non-commercial usage provided that the author is credited. In the sciences, what is being reported also has an underlying substance that can be made the object of IP, but as Robert Dingwall has argued, this is not the case in the humanities and the social sciences, where the article itself is intellectual property. Why, in one case, is intellectual property to be protected and in the other given away? Enter for-profit providers of higher education. The government removed the direct public funding of arts and humanities undergraduate degrees to facilitate their entry and to provide access to revenue from students bearing publicly-guaranteed loans. Open access under CC-BY provides access to publications for curriculum purposes without the costs of the library provision that is a major part of the costs of other universities in the public system. For the arts, humanities and social sciences, the issue is not so much how to commercialise their research, but how to commercialise their teaching by rendering higher education over to multi-national education corporations. This is part of an intended stratification of higher education into an elite, ‘not-for-profit’ set of private universities (modelled on the US ‘Ivy league’) and ‘for-profit’ providers of mass education on a low cost basis. This is also evident in the philosophy underlying the development of MOOCS (Massive Open Online Courses). Once again, open access has a commercial purpose, in that, while the course is seemingly provided free, its certification and support is provided for a fee. Here the ‘elite’ universities – frequently a consortium of them, as with EdX, Coursera and Udacity – are in league with for-profit providers. The former provide courses online, which they then make available for commercial use by a provider of certification (which can be themselves) and a provider of teaching support. This is the model explicitly set out by EdX in the USA and it is implicit to that of Futurelearn in the UK. Or how else are we to understand that the corporate form of a provider of ‘free, online courses’ is that of a for-profit limited company? The Open University is principle shareholder, which simply shows its own transformation from a service to the public and non-traditional students to serving the market with the latter as a source of revenues. The Open University used to make a large part of its materials available as CC-BY-NC-SA (that is a ‘share alike’ license that restricts commercialization), consistent with the OECD Report, ‘Giving Knowledge for Free’ (2007), which advocated open education resources as a continuation of public higher education. ‘Openlearn’ now directs the browser to www.open.edu/openlearn – an American Web address – and its material is no longer openly licensed, and its primary use is for marketing purposes. 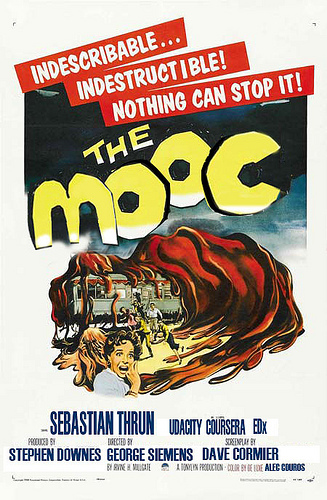 In the emerging new philosophy of MOOCS the status of the universities providing them is maintained, together with the high fees that they can charge for a non-MOOC education, primarily because what they are selling is their brand and education as a positional good in a highly inegalitarian neo-liberal knowledge economy. For the other universities in the UK that fall between the elite and for-profit providers, the future is bleak. Their capacity to sustain research and teaching is undermined by a double-whammy – competition from for-profit providers and the fact that they have been awarded no funding to sustain ‘author pays’ publication under the new open access policies. Indeed, the threat to public universities from MOOCS in the USA has been powerfully set out by Kris Olds, commenting on Moody’s recent downgrading of the entire US higher education sector. Stratification of HE, stratification of society? The key issue is the extent to which the stratification of universities and education will also be a form of social stratification. We already know from the recent Harkin Report in the USA that for-profit education is disproportionately used by students from disadvantaged backgrounds and was castigated for poor quality and poor value for money. In the UK, non-elite universities currently do most of the heavy-lifting on widening participation, but they are most threatened by the imperatives of commercialisation. The democratisation of higher education that followed on from the rise of mass higher education and the expansion of public universities is itself associated with the transformation of scholarship in the arts, humanities and social sciences. New knowledge claims and challenges to elite understandings became part of the curriculum. The Times Higher recently reported the blogosphere debate in the USA, where MOOCs dominated by elite universities are promoted as squeezing out the ‘mediocre’. In truth, as blogger ‘tressiemc’ suggests, they will reinforce both established knowledges and knowledge for the establishment, potentially requiring in the USA a new Brown vs Board of Education to break down renewed segregation. Sir Michael Barber (a member of the Browne Review who went on to become Chief Education Adviser to Pearson, itself the direct beneficiary of this form of commercialisation) talks of a coming revolution in higher education. He suggests it is determined by technological change. However, as the history of the Open University suggests, it is a technology that can serve public purposes. It is a matter of neo-liberal policy that it should be made to serve profits.